I just released a new shirt. 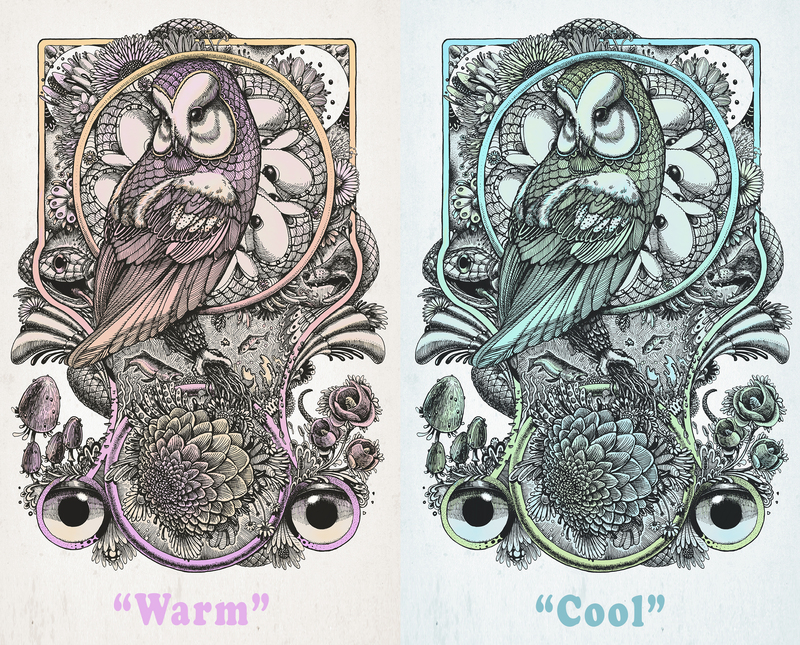 These shirts are handprinted with a lino-cut block, each print is unique and will most likely have a hand made look to it, each print is completely unique and no two will be exactly the same. Printed on a 100% cotton blank with custom printed size tag. Due to the unique printing and curing process, please allow up to 2 weeks for shipping. All orders come with free stickers and goodies. Thank you for looking. (please see last 3 photos, these are actual photos of the print. These will only be available for a week or so. You can grab one now, right HERE! I have a new print up in my shop available in two different versions. One is a 18″x18″ square and the other is a full sized 18″X24″ poster, both printed on 100lb paper and coated in a matte UV coating. These posters are limited and are only $25 each or $40 for the set. Feel free to check them or anything in my store out right here. So after weeks of fiddling with this maze of a print, I have finally finished! This is an 18″x24″ digital fine art print that is made up of a collage of illustrations I did over the past year. Some of these are from my sketchbook, some were client work and some were commissions. These were my favorite illustrations of the year, and like every year i’m offering them up all together as a print,for a limited time! Actually, there is two prints. There is a “regular” version for $25, and a variant edition for $30, there is also an option to get them both for only $40! Whaaaat? yup, you heard me right, BOTH for only $40! Grab one for you AND a friend today, in my store. These prints will signed, numbered and dated and a very select amount (if any) will be available after Fri 12/8. As always all orders come shipped in a sturdy tube (or flat mailer, depending on size) and will include stickers, a business card and maybe a couple extras. I recently released two new poster sized prints, both 18″x24″ digital print on 100lb paper, hand signed, numbered and dated. Please visit my shop if you would like one. Bridge Eight Literary mag pre-order up now. I was recently lucky enough to be asked by the great folks at Bridge Eight Literary magazine to be featured as the artist for archetypes, the sixth issue of this killer publication based in Jacksonville FL. Here’s some details. Archetypes is a crafted collection of short stories, poems and nonfiction pieces that explore the beliefs, hopes, and dreams that tie us all together—and sometimes drive us apart. It’s unlike anything we’ve published before, just like you’d expect. You can Pre-Order this issue here!